Goodbye guesswork, hello data-driven decisions. Your gut instincts are all you need to make many decisions, like choosing what to wear in the morning or trying a new dish at your favorite restaurant. But when it comes to making strategic decisions for your organization, you probably want more to work with than just a hunch. BambooHR’s reporting software makes it easy to generate detailed reports on almost any data in your core HR system with just a few clicks. From workforce planning to approval tracking, our full reporting gives you the data you need to move forward with confidence (instead of a gut feeling). 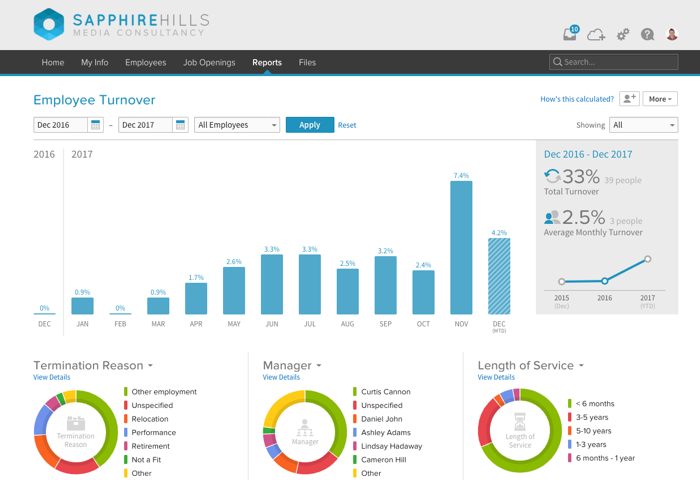 We can help you analyze HR data instead of compile it, be proactive instead of reactive, and turn your HR department into the strategic resource it was meant to be. Take more than a shot in the dark. 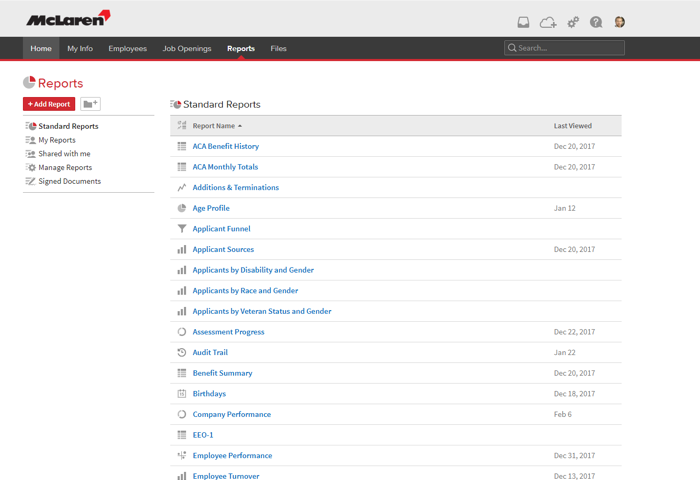 See what fast, accurate reporting can do for you with a free seven-day trial of BambooHR. No more playing catch-up with HR data and reports. Another day, another surprise meeting with the executive team—and they love to look at the numbers. When you’re working with a tight deadline, you hardly have time to find and gather all of your HR data, let alone analyze it and form a conclusion. But that’s exactly the kind of information that could have a huge impact on your organization. Good thing BambooHR puts easy, beautiful reports at your fingertips. We can help you generate a variety of HR analytics reports in a matter of minutes, so you can make strategic, proactive decisions—just in time for that last-minute meeting. Without an automated HR system, human resources professionals spend an average of 17 hours each week creating reports, according to one estimate. If you ask us, that’s a lot of valuable time going to waste. But we can help you win it back. With BambooHR, you only need a few minutes to gather data, generate a report, and share it with your team. 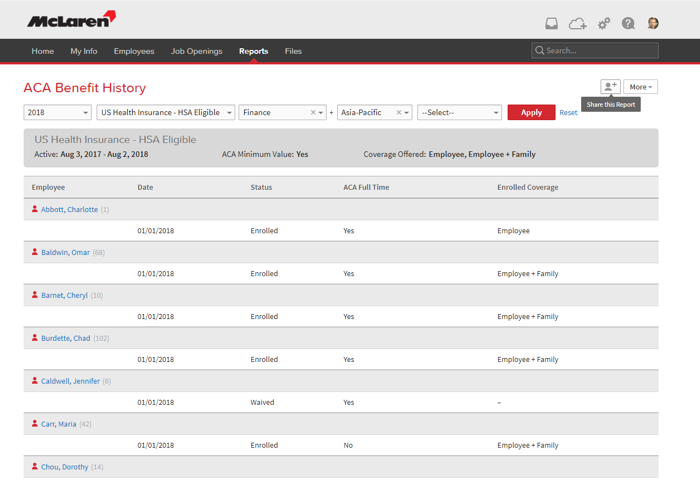 Our reporting tool allows you to create reports for workforce planning, PTO usage, and more whenever you need them. HR reporting that fits your organization. 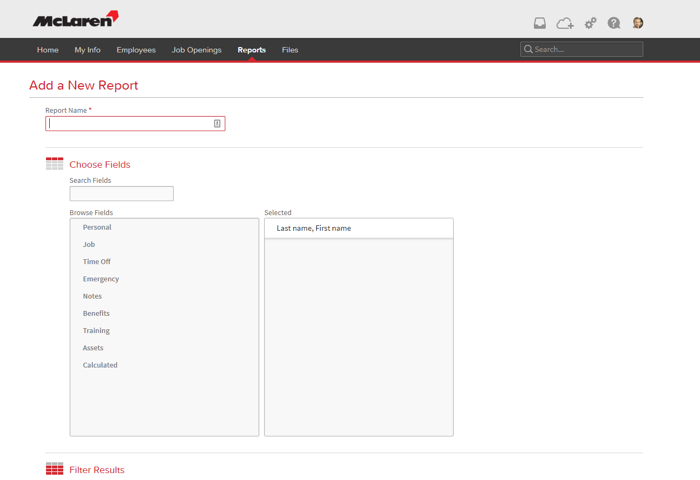 To get you started, our core HR system includes a library of report templates for you to use. From headcount and EEO-1 reports to approval processes and workforce metrics, we have you covered with all the basics. But we know HR reports aren’t a one-size-fits-all solution. With the Advantage package, you can go beyond the template library to create your very own custom reports that show you exactly what you need. This means you can take a deeper dive into your organization’s HR data and make decisions tailor-made for your people. 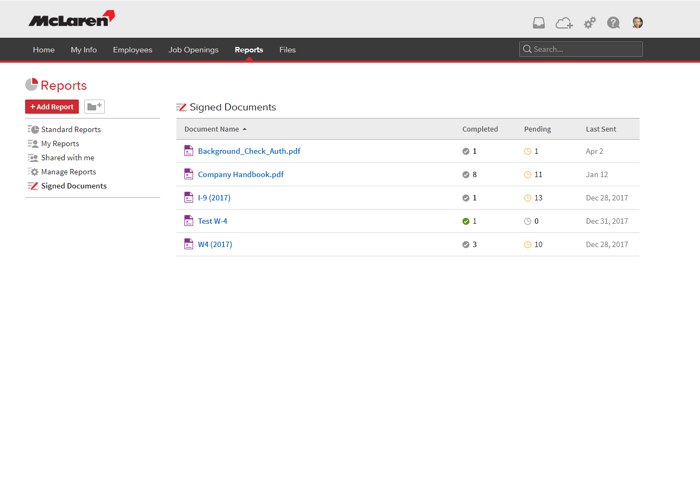 Track electronic signatures without leaving your desk. Even if you had the time, you have better things to do than chase signatures all over the office. But you still need the sign-off from everyone in the approval chain. Our e-signature software includes tracking reports that make it easy to monitor documents as they move through the approval workflow. Identify and eliminate bottlenecks by determining which forms have been signed and which are still pending. You can quickly follow up with managers or employees who may have forgotten to sign their forms, and you’ll feel confident that all the necessary paperwork is in the works. The right data, the right people. You’ve set up your custom template and pulled the report—now it’s time to share the data with the decision makers in your organization. But what if Report A needs to go to one manager, Report B should be sent to another, and Report C is for the CEO? With BambooHR, you can share the right report with the right individual or team instantly. We help you protect sensitive information by controlling who views which data, and overcome analysis paralysis by sending out reports as soon as they’re ready. Together, we’ll make human resources your organization’s new MVP.